Motorola couldn't have chosen a worse time to start selling the Xoom, the first real Apple iPad competitor. Just as the Xoom went on sale on Verizon, Apple dropped an iBomb in the shape of a press invitation next week to the unveiling of the next generation iPad (let's call it the iPad 2). 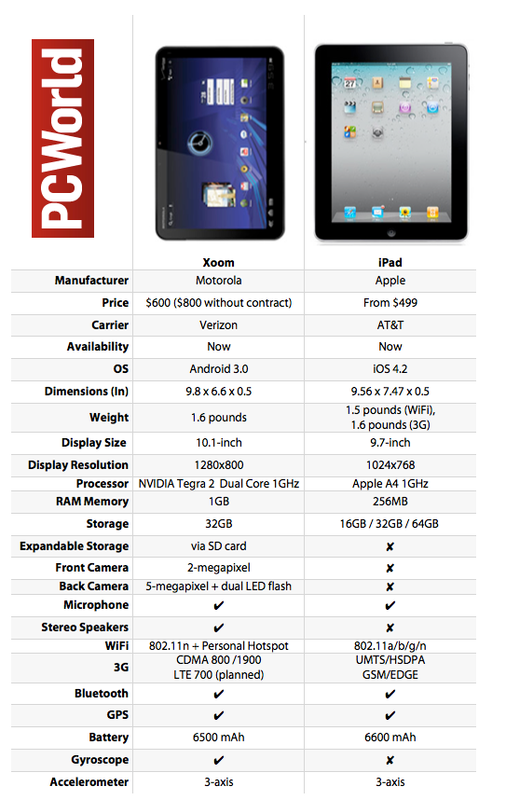 But even with the iPad 2 looming, Motorola's Xoom will have to go head to head with the original iPad. If you can't hold on a bit longer without a tablet, here's how the Xoom and iPad stack up against each other. The Motorola Xoom packs some serious specs, making the original iPad look a bit behind the times. It runs on a Nvidia Tegra 2 dual-core processor clocked at 1GHz (iPad has single-core 1GHz), has 1GB of RAM (vs. the iPad's 256MB) and rocks not one, but two, cameras: a 2-megapixel front-facing camera for video calling and a 5-megapixel one at the back, while the iPad has no cameras at all. The Xoom's screen is also slightly larger (10.1-inch vs. 9.7-inch), and the resolution is slightly higher too (1280 by 800 pixels on the Xoom, 1024 by 768 pixels on the iPad). Both tablets are similar in size and weight. Besides the spec advantages the Xoom has over the current iPad, Apple still has some (very important) tricks up its sleeve: pricing and applications. A 32GB Xoom will set you back $800 without a contract, compared to the equivalent 3G iPad at $729. If you sign a two-year data contract with Verizon, you can get the Xoom for $600, but that does mean an extra contract--unlike the iPad's 100 percent pay-as-you-go structure on AT&T. In the future a WiFi-only Xoom would be able to better compete on the $499 starting price of the iPad, but so far, Apple has the essential pricing advantage. The Motorola Xoom is also the first Android 3.0 tablet to hit the market, a tablet-optimized version of the popular smartphone OS. Google integrated in Android 3.0 some nifty multitasking features and widgets, which impressed reviewers. PCWorld's Melissa J. Perenson details six things to love about Android 3.0. Although Android has moved onto tablets, it doesn't mean applications have migrated too. Apple has thousands of iPad apps, while Android has yet to catch up with tablet-optimized apps (read close to none). Adobe Flash is notoriously absent from Apple's iOS products, and its existence on non-Apple products should have bridged the application number gap between the two OSs. Unfortunately for Motorola, Flash won't arrive on the Xoom until a few weeks from now, which means the tablet can't even view its own website right now. Motorola also promises free upgrades to the 3G radio inside the Xoom (to Verizon 4G). Unfortunately, again, this will be available some three months from now, and you will have to send your Xoom in to Motorola for six days for the upgrade. In addition, it appears that the SD slot on the Xoom (another advantage over the iPad) won't be usable at launch, due to a reported issue with Android 3.0. Nevertheless, Motorola Xoom's is putting up a good fight against the iPad. Its impressive specs, fresh Android software for tablets and multimedia capabilities outgun the original iPad for someone who wants that little extra from their tablet. However, if you hold back a few days, the Xoom's appeal might change once the iPad 2 is announced. The iPad 2 is expected to level the specifications playing field between the two tablets, with at least a front-facing camera, thinner and lighter body and more performance.